In his opening remarks, Permanent Representative of Azerbaijan to UNESCO, Ambassador Anar Karimov highlighted life and works of great composer Gara Garayev. He said that the Azerbaijani folk music was a source of inspiration for the outstanding composer. He drew the audience’s attention to the fact that there is a street, subway station named after Gara Garayev in Baku. In order to perpetuate the memory of the prominent composer a monument to Gara Garayev was unveiled by President Ilham Aliyev in the center of Azerbaijan`s capital. Assistant Director-General for Communication and Information Sector at UNESCO Moez Chakchoukh noted that Gara Garayev's music promotes dialogue among nations and reflects a way leading from the past to the future. 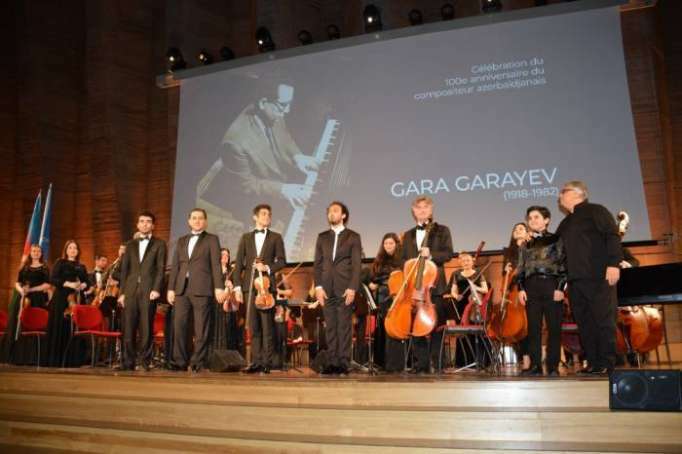 The event was followed by a concert conducted by Fuad Ibrahimov, which featured performance of Farhad Badalbayli, Murad Huseynov, Vurghun Vakilov, Jamil Sadizade and Elvin Khoca Ganiyev. Then participants viewed a photo exhibition and documentary films devoted to the great composer Gara Garayev. Editions of a magazine and different CDs about the composer’s life and works were distributed among the participants.